I would like to thank Sav On Moving and Storage for the outstanding job they performed on Saturday. Matt and Rob are professionals and displayed those characteristics that make Sav On Moving, a company to recommend to my family and friends. I just wanted to send our sincerest thank you for sending such a competent and enthusiastic crew for our move here at ISTA Pharmaceuticals. I had only to point to the offices involved, instruct once as to where they were going, and your guys were off and running. Thank you also for getting the boxes to us so quickly! Hope to do business with you again soon! It is our 4th time that we are doing business with Sav On Moving and Storage in the past 3 years. We are glad to say that it is always perfect. Special thank you to the 3 men that did the moving. (Roland, Moses, Chestire). They worked hard and were always meticulous, courteous, and fun, regardless of the hours. They made the moving easier…. Just wanted to write and let you know what a great job your men did for me on April 28th, 2004. Dave and Lawrence were very careful and worked very hard for us. Thank you for making our move such a nice experience. I will recommend your company to all my friends and family. On behalf of the Federal Aviation Administration, I would like to express our sincerest appreciation for the support and expertise we received from David, Patu and Alec during the first phase renovation project for our Executive Resource Staff office. I would also like to express a special thanks to the crew that worked on the second phase of this project, which took place on August 18th. Even during a power failure that impacted the entire building, your staff continued to work, and was able to complete the job on time. I would like to take a moment to thank you for all your excellent work. 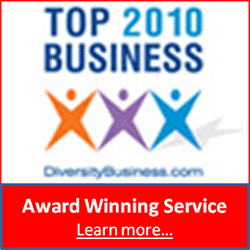 We have had numerous moves with your company and have always had outstanding results. This move went claim free, thanks to the performances of your team from start to finish. Thanks again and keep up the good work. My husband and I are realtors with First Team Real Estate in San Clemente. Last Friday, we had something that had not happened to us in our combined 30 years in real estate. We were representing a seller whose home closed 1st Friday. They were scheduled to move out at 2 p.m. on Friday. At 1 p.m. they were called by the moving company that they had hired and were told by the company that they had to cancel on them and could not move them until the following morning. The buyer’s agent indicted that their buyer would not give them until the next morning and they had to be out that day! We called numerous companies and got the same answer which was “we can do it on Saturday but not today at this late notice.” By now it was about 4 p.m. Then Sav On came to the rescue. Your dispatcher Hebert Moses was amazing. He helped us beyond belief. He was able to get 2 movers for us and they were in San Clemente within about an hour and a half. Our seller’s indicated that the movers were polite and courteous and worked really, really hard. The van then had to be driven back to your business as our client’s were moving into Laguna Woods and one cannot move in after 6 p.m. The guy’s were back the next morning, right on time and moved them into their new home. What could have been an incredible nightmare was avoided due to your wonderful dispatcher, Herbert. Please send our sincere thanks to Herbert, in particular, and also to the movers. It was certainly a job well done. 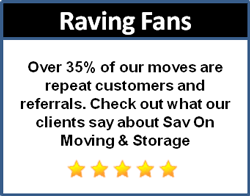 Sav On will be at the top of our list next time a client needs a good mover. We will be telling everyone what a great company Sav On Moving is and recommending your services to anyone we find out is moving. Thanks again from a grateful and loyal customer. On behalf of the people we help through your support, the American Red Cross extends our deepest appreciation to you for supporting the American Red Cross of Greater Los Angeles during this time of need. Your in-kind gift of 2 movers to pack/deliver contents of an estate left to the Red Cross is helping the Red Cross fulfill its mission. Doug and Kelly were fantastic! We wanted to extend our sincere thanks to a great crew (Tra, Patu and Alec) for the great job on our recent move. It was quite an undertaking to combine two households and we appreciate their great attitudes! We have already referred your company! Again, thanks so much! Glad They Found Sav On Moving & Storage! I am so glad I found your company from Angie’s List. I did check with a lot of other companies and their reviews were terrible. Your company has much better reviews. I am totally happy with your salesperson, Shannon, your driver, and the movers. They were polite and honest about the charges and the items I have. I couldn’t have a better moving experience! I will definitely recommend your company to all my friends and we’ll use you again this summer for our second move from California. Everything was very great. Excellent service! Thank you! Herson and David did a great job. They are hard and fast workers. They made my move less stressful. Great team effort! Excellent crew-very professional and took care of our items. Will highly recommend! Very good job! Very courteous and helpful! Dan, Edgar and Sundro were fantastic! They made me enjoy my move. Give them a raise! Herson and Mario were professional and very quick on the packing. I would recommend them to anyone who is moving. Great service from packing to pick up crew! Both crews were excellent! No problems whatsoever-Thank you! The team was immaculate in appearance and polite. Knew what to do and did it quietly and professionally. Thank you. Very courteous and did an excellent job! The 4 Sav On movers that came to my home to move my family were awesome. I will recommend Sav On to everyone. Crew on time-professional. Good at their job. I’ve moved a lot and Ed, Edgar and Sandro were excellent and I’d highly recommend them! I will used the again! Very happy with this wonderful crew-Thank you!